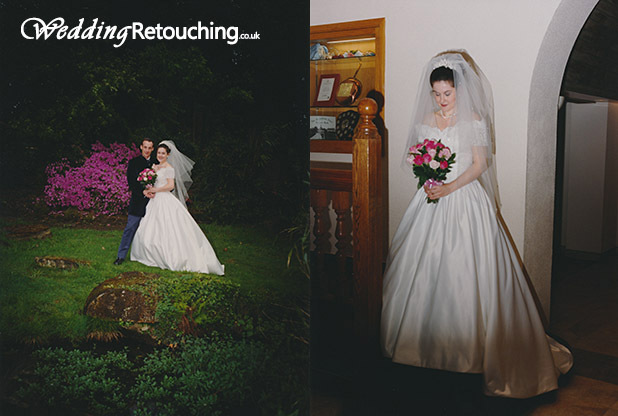 Wedding retouching for wedding photographers. Personal “Uncle Bob” wedding photographer story. My Uncle Bob, who shot my wedding was actually a “wedding photographer with a portfolio”. He had shot my best man’s wedding. My best man’s wedding album was great, with complimenting colours and natural lighting, it was beautifully composed to compliment the bride’s skin. Having a degree in photography myself, I was subtly impressed with his work. My wedding day came and the wedding photographer, who I am now calling “Uncle Bob”, produced a medium format camera. Oooh, I thought, nice kit! nice big negatives and some great detail there. I had been using a Mamiya C330 6×6 and loved the high detail and great tones you can get when printing from such large negatives. Excited, I let the photographer get on with the day. A tripod setting up ready to go, a good sign!. He produced a barn door style lens hood for the camera and seemed to spend a lot of time messing with the doors and taking pictures of us from a great distance. The shoot took moved on with some inside shots, shot with fill-in flash, or so I thought. Uncle Bob bounced the flash off the ceiling, as I had done many times before shooting documentary shots and candids. He is doing everything right, I convinced myself and relaxed into the photos. He seemed to spend much time changing films and this gave me much encouragement that there would be plenty of great images to choose from. My friend John who loved photography and owned a 10×8 plate camera shadowed the Photographer. He did not get in his way and did not offend anyone, just snapping a few photos for himself on his Bronica. Guessing exposures on his way around with no light meter, just him and his camera. Changing his films just as quick as the photographer. The time to view the wedding photo proofs soon arrived and we thought they looked ok but a bit dark in places. We looked further and we seemed very distant and away from the camera in the outside shots, like we should have been shot with a zoom but weren’t. We were tiny people miles from the camera. The inside shots with flash, contained serious flash fall off, half the image was dark, obviously, the fill-in flash was not used. In short, the images were trashed. To top it all the outside shots at pre-wedding drinks were out of focus!! Uncle Bob’s useless photos. Left BarnDoors lens hood darkened image and right, flash fall off. Even I could not fix these images! Weeks later after reeling in shock and disappointment, John appeared at our door bearing a travelling portfolio case. In it were beautiful prints of silver halide, black in 10×8 and mounted. “Your wedding gift!” he proclaimed. The moral of such a story is just because your friend’s wedding photos turned out ok doesn’t mean yours will too. The fact, “Uncle Bob” had recently changed his kit to medium format. He had little or no experience of it and effectively used us as guinea pigs. This proves that experience means everything. Grill your photographer about the kit he uses, “show us images you have taken with this kit” and “how many weddings have you done with this kit ?” are questions you need to ask. Not all us will have a “John” to provide a backup wedding album! Retouching artist, Lynda.com Author a well rounded imaging professional.